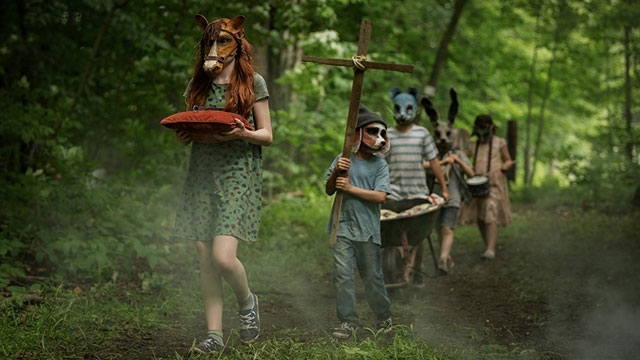 The latest Stephen King adaptation (and remake), Pet Sematary is terrifying. It follows the same overarching plot as countless other scary movies: the family moves to a new house, the children start to see weird things, and the parents refuse to move. Thankfully, the mystique and setting of the film drowns out any stagnant plot points and paves the road for a truly fear-inducing experience. Co-directors Kevin Kölsch and Dennis Widmyer keep the audience on edge and uneasy with a film that is sparse on comfortable moments. There are some questionable inclusions and a few typical “gotcha” moments, but nothing that completely bogs down the film. Pet Sematary is as memorable as it is haunting, and that is not the recipe for a good night’s sleep. After relocating to the small town of Ludlow, Maine, Louis (Jason Clarke) and Rachel (Amy Seimetz) are determined to live a simple life. As they settle in, their curious daughter Ellie (Jeté Laurence) stumbles upon a “Pet Sematary” in the adjacent woods. Her curiosity is curbed by long-time resident and neighbor, Jud (John Lithgow). As time passes, Ellie’s cat, Church, is hit by a car right outside of their house. Knowing that Ellie would be devastated, Louis and Jud discretely take the cat to the Pet Sematary. While burying the animal, Jud suggests that they bury it a bit deeper in the woods, in a secret place. The next morning, as Ellie’s parents are telling her that Church ran away, Ellie mentions that she saw her cat that morning. Sure enough, Church comes back, but something seems a bit off. Pet Sematary is full of unsettling moments. The cast sets the tone, highlighted by Jeté Laurence’s frightening performance. The familiarity of the feature is quickly corrected by not letting the audience get comfortable, thanks to clever and sporadic scares. Moments of tension build up throughout, but not all these moments end in that jump scare we have grown accustomed to. Sometimes, the scenes that stick with you are the moments when you’re anxiously anticipating the next fearsome event. Kölsch and Widmyer respect their audience and never get too repetitive. There is nothing deep about Pet Sematary; it is essentially an entertaining journey through this family’s nightmare. Some story elements, like Rachel’s past, seem more like filler than anything else, as the movie would have chugged along just fine without it. There is a certain charm to Pet Sematary, if only because it can be scary and fun at the same time, and King’s simple premise goes a long way in shaking the audience to its core. If nothing else, Pet Sematary may change the way you look at a cat for a while.